Potatoes make their appearance more often around this time of year at our house. I’m sure the reasons why are no surprise – it’s finally cool enough that baking them in the oven won’t cause an unwelcome heating of the house, they’re inexpensive, and when the temperatures drop, we all reach for comfort foods, and potatoes are one such food. Truthfully, I don’t eat them all that often, but it’s nice to have more options than the usual potato choices – baked, mashed, or roasted. (Yes, there is always the fourth option – fried – but that’s just an awful lot of mess and work for a less-healthy version of this vegetable.) 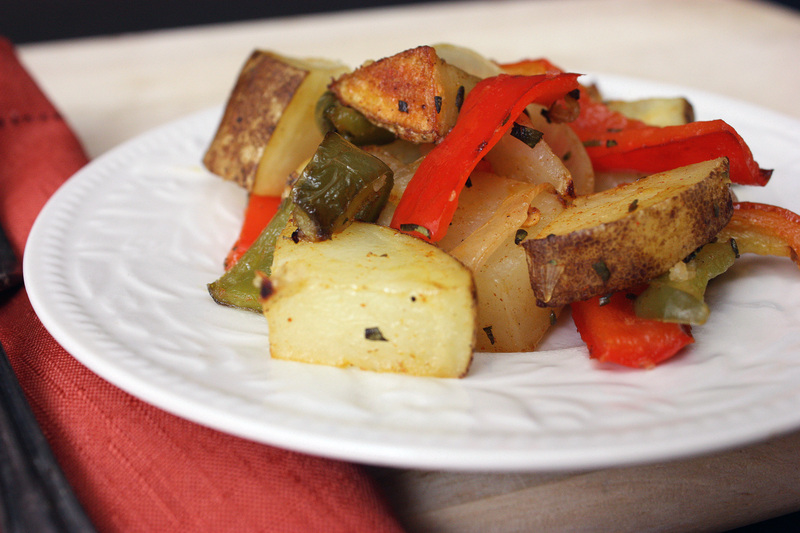 This easy-to-make side dish is a simple variation on my usual roasted potatoes, and offers a delicious punch of flavor and color. It’s really more of an un-recipe, because truly, measurements are approximate, and you can substitute out a variety of different veggies. Want to add a mix of root vegetables? Try throwing in some carrots or parsnips. Don’t have rosemary? Throw in some thyme, or omit the herbs entirely and instead add some chili powder and cumin. Or make it spicier by swapping out some of the bell peppers for spicier poblanos or Anaheim chiles. It’s all good, and it will keep your side dish from becoming an afterthought! Preheat oven to 425 degrees. Place potatoes, peppers, onion, and rosemary in a baking dish large enough for vegetables to spread out into a single layer. (Don’t crowd, or the vegetables won’t have a chance to crisp and brown.) Add oil and spices and toss evenly to coat. Roast in the oven for 30 minutes or until potatoes are pierced easily with a fork. Stir once or twice during roasting. By now, we all know that packing a lunch, rather than eating out, saves money and is healthier for us (At least, if we pack whole, unprocessed foods. A can of soup or ramen doesn’t really count as “healthier”.). But it takes time and effort to pack a lunch every day, and sometimes, you can fall into a rut. Valerie over at City|Life|Eats has been hosting a lunchbox series, where she highlights various healthy, unprocessed lunchbox ideas. I thought this was a great idea, so when she asked me to write a guest post, I was honored. I pack my lunch every weekday, and thought it’d be fun to contribute my thoughts and ideas. 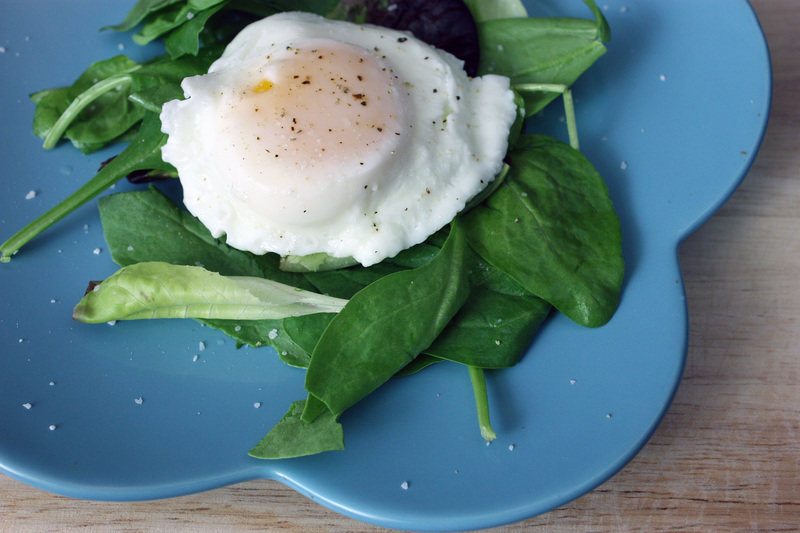 Today I’ll be sharing a great “trick” – how to poach an egg in the microwave! Head on over to City|Life|Eats to check it out, and while you’re there, browse around for some other great lunch ideas! So I waited until the eleventh hour to start the Daring Bakers Challenge for this month. For some reason, I got the dates confused (again), and I had it stuck in my head that I had until the 1st of the month to make it. (Yes, I realize that by waiting until this upcoming weekend, I was already procrastinating.) This morning, I read new posts at a few fellow food blogs and realized today was the due date. I decided I was too late, and went ahead and made plans to just let the Daring Kitchen know that I would miss this month. But my husband encouraged me to go forward with it, so I did. (He’s a wonderful guy that way!) But I hadn’t given the process a lot of thought, other than I knew I wanted to make pumpkin donuts. The October 2010 Daring Bakers challenge was hosted by Lori of Butter Me Up. Lori chose to challenge DBers to make doughnuts. She used several sources for her recipes including Alton Brown, Nancy Silverton, Kate Neumann and Epicurious. I opted to modify the Alton Brown recipe, but I pretty much winged it. I decided to bake rather than fry, and I tried to substitute a mixture of potato starch, tapioca starch, sweet white rice flour and sorghum flour for the wheat flour. I used almond milk instead of regular milk, and lowered the moisture and added pumpkin puree. But the dough didn’t really rise. The flavor was decent, but I had dense, slightly gooey, donut pucks. I plan on working on the donuts again, as a perfect pumpkin donut sounds so incredible to me. But this time, I think my failure to plan and research (and play in the kitchen) got the best of me. 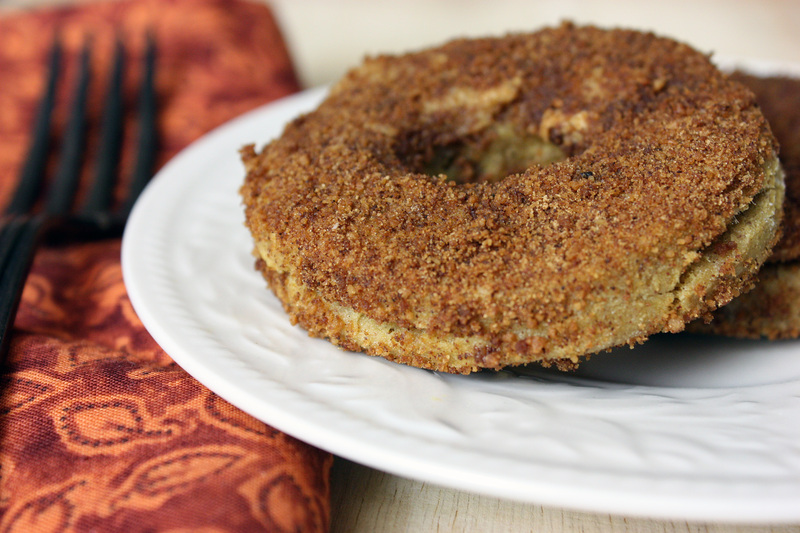 If I manage a perfect gluten-free, dairy-free pumpkin donut soon, I’ll be sure to share the recipe with you! Until then, check out this basic gluten-free donut recipe, and a different version of a pumpkin donut hole recipe over at Baking Beauties. Winner of Fresh Express Coupons! The winner of the Fresh Express coupons (giveaway details are here), chosen by random.org, is Joy at Joy’s Misadventures! Congrats, Joy! I hope you make delicious salads with these free bags of Fresh Express salads. We’re going to celebrate this holiday season totally gluten-free. Why? Well, we know how important it is to serve safe and delicious food at the holidays. We want to help as many people as we can do just that this holiday season. Our amazing hostess, Amy (Simply Sugar & Gluten Free), and five gluten-free blog friends, are participating in this holiday celebration. This will be the second year for such a celebration, and I’m so excited to be a part of it! And, of course you are invited! If you weren’t there it just wouldn’t be a holiday celebration. 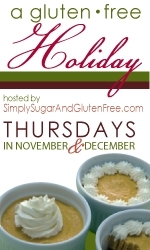 On Thursdays in November and December, a different gluten-free blogger will host a link-up event where you can share your best gluten-free holiday dishes. The linky will be open until the following Wednesday at 10:00 pm CST. Every week we’ll have a give-away, too. You can link up or leave a comment to enter. Give-aways will be revealed soon! Let’s all get off to a healthy start this holiday season. Bring Ricki your favorite healthier dish that won’t pack on the pounds. Of, maybe you can share your top tips for staying slim when there’s tempting food everywhere. Who doesn’t love a gift made with love? Share your favorite foodie gift that’s gluten-free. Have a fabulous way to pack a yummy treat? We want to see that, too. Bring your families favorite entrees and sides. Diane will be ready for them all. We know that Haunnkah starts on December 2nd this year but still hope to see some of your favorite dishes. A warm, cozy breakfast or brunch is a wonderful way to start off the holiday. This is a great time to help someone else whipping up your fabulous gluten-free cinnamon rolls or a crumb-topped coffee cake by sharing your favorite recipes. Just like it sounds – bring your favorite gluten-free Christmas desserts for all to share. Cookies, pies, truffles, cakes, and candies….we want to try them all. So, get your recipe box out and start browsing…then get in the kitchen and start cooking for the best ever gluten-free holiday! Today I am a guest blogger over at The Gluten-Free Homemaker for Squash Fest. 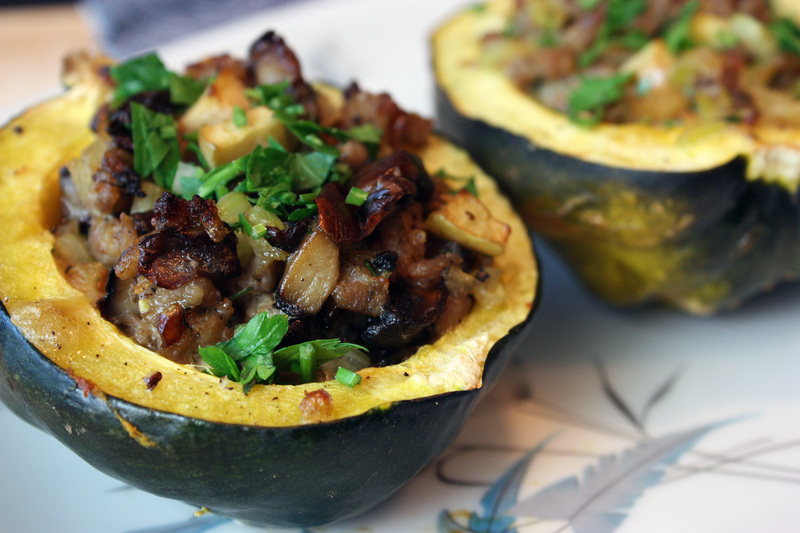 Go on over here to check out my recipe for sausage-stuffed acorn squash. While you’re there, check out all of the other delicious squash recipes – guaranteed to make your mouth water! Matt is our pasta lover. If he could have spaghetti every day of the week, he’d be a happy camper. (This is evidenced by his previous spaghetti carbonara, spaghetti and meatballs, and lasagna dishes in the kitchen.) So when Matt was browsing through a recipe application on our iPad, it didn’t surprise me to see that he’d chosen another pasta dish. This one was fairly straightforward. However, it did surprise me that my picky eater wanted sundried tomatoes and olives. I even asked him to double-check and make sure he understood what was in the pasta. He said it sounded good, so we went ahead with it. Of course, we used gluten-free pasta (Tinkyada). It’s a good product – while it’s technically processed, the ingredients are essentially brown rice, rice bran, and water. Simple. I did like that this was really easy to throw together. Definitely a good weeknight dish. However, we weren’t 100% happy with the flavor. It was missing something – a sauce, perhaps? Matt did admit that he wished there was tomato sauce on it. Matt admitted that he thought somehow that the ingredients would make a sauce based on what he read. This means the teacher learned a lesson in the kitchen that day – to explain the dish better in the future, so there’s no confusion! Regardless, it was a dish that could be improved upon, should we try again. Heat a large pot of water to boiling. Cook pasta according to package directions; drain and set aside. Toss chicken cubes with paprika and salt and pepper. In a large skillet, heat grapeseed oil to medium-high heat. Add chicken and spread out into a single layer. Allow to brown for a minute, and then stir occasionally to brown on all sides. After chicken is nearly cooked through, add sundried tomatoes and garlic. Saute for another minute and add olives and pine nuts. Check seasoning and add salt and pepper if needed. Remove from heat and toss pasta and chicken mixture together. Serve garnished with basil. Easy Canvas Prints – It’s Time to Decorate! 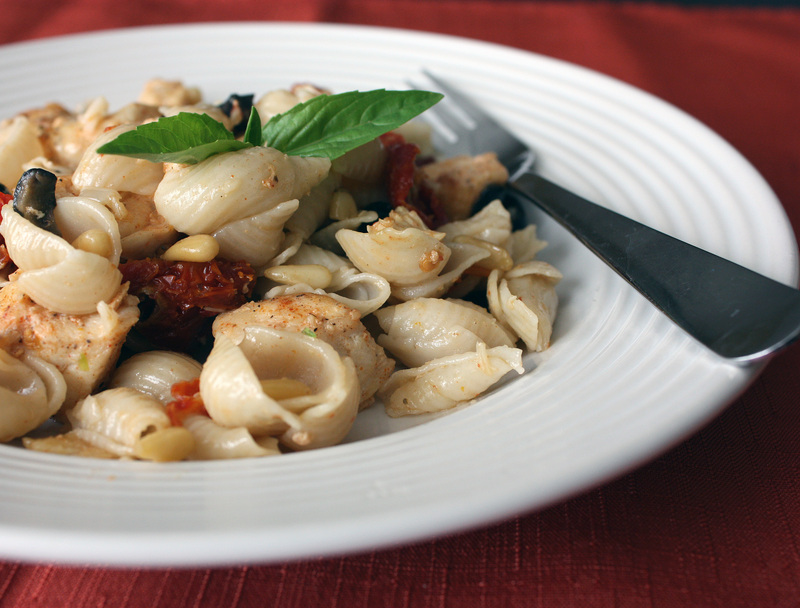 Tasty Eats At Home · cooking from scratch, one recipe at a time – gluten-free since June 2009!